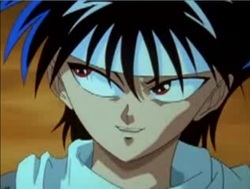 Hiei is often aloof and refuses to make emotional ties to anyone. His ego is bloated with self-confidence and looks down upon the human race as inferior. Though he outwardly claims emotional attachments are a hindrance, he has a violently extreme sense of protection for people such as Yukina. He is quite intelligent and often provides logical insight when necessary. Underneath the white band he wears around his forehead is his Jagan eye, which serves to his advantage both in and out of battle.